Whilst watching a recent edition of Jay Leno’s Garage on YouTube I was reminded of what a cool car “The Duesenberg Hot Rod” actually is! I saw some pictures of the car years ago and with the mainstream coverage of the old car hobby these days it was nice to see it up close via Jay’s channel. The car was built back in the 40’s by Hal & Bill Ulrich. Dave Blake shares an important piece of hot rod history the car won the first nationally sanctioned SCCA drag race! The Blake family has owned the car since the mid 70’s, Mr Blake’s Father saved the car from being sold and broken up for parts, Mr Blake couldn’t afford to buy the car but traded it for a Cadillac. Watch the video to hear about the history and the modifications to this piece of Hot Rod history. 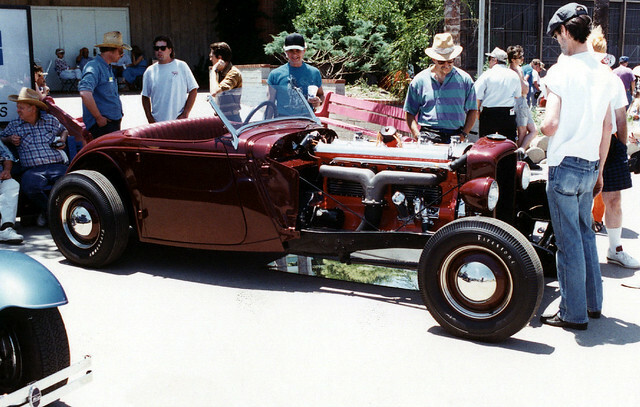 The car pictured in 2011 via The Hot Rod Disorder blog is I believe based off a 1934 Ford body and Duesy chassis and running gear. Here’s another shot from Howard Gribble on Flickr with some background on the car.